GOOD MORNING FRIENDS! Hope you had a great Thanksgiving holiday. I spent the day with my husband and parents. I decided that I was not going to cook so I had all the dinner fixings catered — turkey, stuffing, mashed potatoes & gravy, and mixed vegetables followed by pumpkin pie and ice cream. My mother loves jigsaw puzzles so we brought three new ones over to the house with us and spent the day working on puzzles in between bouts of watching football and holiday eating. But now it’s on to the next holiday, which in my case is Christmas! So I’m back today with a relatively simple card featuring one of the new digital stamps by Power Poppy – Hand Lettered Jolly Good. 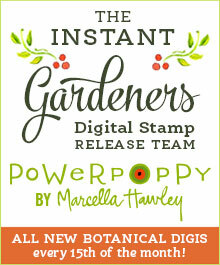 Now as you know, today is Cyber Monday and Marcella is having a digital blitz over at Power Poppy. She is releasing TEN digital stamps today that were previously available in clear format only. In addition, she’s offering 20% OFF your entire order with code CYBER20. This offer starts Monday, November 26 at 12:01 AM CST and ends Tuesday, November 27 at midnight CST and includes in-stock stamps, dies, and digital images – including brand new digis. Time to stock up! I’m waiting on their website update. In the meantime, you can call the store to register. Nancy, what a beautiful card! I love your coloring and colors, and I love the die you’ve used for this image of the great DP! Perfect to add the dew drops…brings out that vibrant blue! Hugs!